Is first-hand experience important to encourage electric vehicle sales? The answer is a solid ‘yes,’ according to a Green Car Institute survey conducted at the New York International Auto Show. Of 752 people surveyed who participated in a battery electric vehicle ride-along, 85 percent said that riding in an electric vehicle influenced the way they felt about EVs, with more than 96 percent saying they had a more positive view of EVs after riding in one. Survey respondents had the opportunity to ride along in Nissan LEAF and Mitsubishi i-MiEV battery electric cars, plus Chevrolet Volt plug-in hybrids running exclusively on battery power. 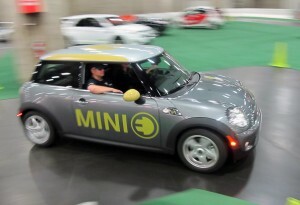 More than 15,000 New York auto show attendees participated in the ride-alongthat took place on a course conveniently sited on the show floor. More than 82 percent had never been in an electric vehicle before. In a second survey of 849 people who also participated in the electric vehicle ride-along, 59 percent of those surveyed said they did not know enough about EVs based on what they’ve learned online or from print and broadcast media. That’s an important revelation. As much as electric vehicles are discussed, extolled, and debated today, a significant percentage of the population still doesn’t understand them. In fact, a full ninety-three percent of survey respondents shared it was important to their understanding of electric cars to see them in person and experience them during a drive.